Last summer, Mitsubishi announced details of its new global visual image that dealerships are adopting. And the first one to flaunt the new look in North America is St-Hyacinthe Mitsubishi. To grab everyone’s attention, this new image relies mainly on black, with red accenting that brings a touch of dynamism. A slanted black panel, placed on the left side of the building, wears the manufacturer’s logo and its perforations let light sift through the grey and fully glassed façade. At dusk, the effect is striking with the illuminated red striping. Also: Mitsubishi Engelberg Tourer : Could This be the Next Outlander PHEV? As for the showroom, it presents a clean, predominantly white design, contrasted by black accenting and a black-painted ceiling. As is the case with most modern car dealerships, this one offers a connected area for working or relaxing while our vehicle is being worked on. The service bay is also windowed, allowing customers to see the technicians in action. Mitsubishi Motors of Canada confirmed that the materials used to create this visual signature as well as the furniture are provided by Canadian suppliers. 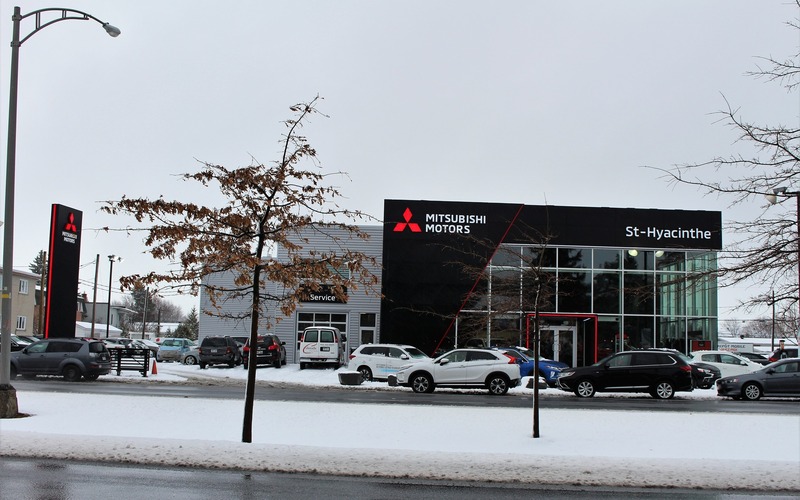 St-Hyacinthe Mitsubishi dealer principal Dominic Fortin admitted having invested three million dollars in the reconstruction of his establishment, which is now twice as big. To keep the showroom open during the renos that lasted 10 months, the new structure was built over the old one, and the latter was then torn down from the inside. Around the 11,000-square-foot building, 10 charging stations were installed because the Mitsubishi Outlander PHEV is a strong seller over there. 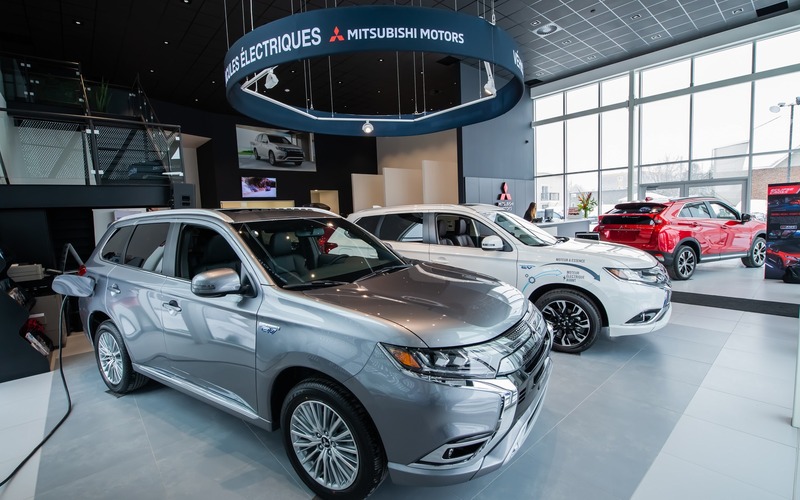 As a matter of fact, according to Juyu Jeon, Mitsubishi Motors of Canada’s new president and CEO, the St-Hyacinthe dealership is among the best in the country in regard to moving out plug-in hybrid models. As these lines as being written, 64% of the brand’s dealers in Canada signed up to adopt the new image, and in the coming months, Ajax Mitsubishi in Ontario, Steele Mitsubishi in Nova Scotia and Charlottetown Mitsubishi in Prince Edward Island will have completed their modernisation work. During the official opening of the St-Hyacinthe dealership, Mitsubishi Motors of Canada confirmed its annual $100,000 donation to the Breakfast Club of Canada, which helps thousands of kids start their day at school on the right foot. All that’s missing now are new products to garnish showrooms. The refreshed 2020 Mitsubishi RVR should be on sale this fall, a new generation of the Mitsubishi Outlander will launch for the 2021 model year and other plug-in hybrid and fully electric models will be revealed within the next couple of years.